Size of Male: 150 lbs., 24-31 in. The Neapolitan Mastiff is said to be a very old breed dating back to the time of the Roman armies. The breed was “rediscovered” in Italy in the 1940s and brought back from extinction. “Neos” can be recognized by their massiveness! They have massive heads, massive bodies and they are simply massive all over. This giant dog breed also has plenty of loose skin and wrinkles. These dogs are said to be steady and loyal to their families but protective around strangers. However, because of their size, strength and temperament, they are not recommended for first-time dog owners or families with young children. The Neapolitan Mastiff dates back to Roman times when these dogs fought alongside the Roman legions in battle. It’s said that they were favored by Alexander the Great. Once their war days were over, the dogs were used in the following centuries as estate guard dogs throughout Italy. It’s said that Neos were intentionally bred to be not only huge and imposing but were also bred to be frightening and ugly in appearance so they would frighten intruders. They were popular throughout Europe at one time as guard dogs. However, the breed was nearly wiped out during World War II. They had to be re-established following the war when dedicated breeders began working on the breed and set up a breed standard. This dog breed is intensely loyal. They are affectionate and devoted to their masters and they are good family dogs. However, they are not recommended for first-time dog owners or for families with young children. The dogs are extremely large and powerful and they can easily hurt children by accident. They are also fierce dogs when it comes to protecting their homes. This dog breed requires dog training and a great deal of socialization from a young age to be a good family pet. Because of their wrinkles and propensity to drool, they can also be very messy dogs to have around. You need to be prepared to clean up a lot of drool if you have one of these dogs! Living Environment – Neos prefer to be near their family and home at all times. They are guard dogs and they take their job seriously. They can be outdoor dogs but they prefer to be indoors if possible. Because of their large size many people will prefer to keep them outdoors, but the dogs do not do well in great heat. The breed is prone to heatstroke. They can be apartment dogs if they have some exercise every day since they are relatively inactive indoors. Grooming – Grooming the coat of a Neapolitan Mastiff is not difficult. The coat simply needs to be brushed regularly and the dogs should be bathed occasionally. However, because the breed has extensive wrinkles, the dog’s skin should be checked regularly and the folds cleaned to avoid any bacterial infections, especially around the face. Diet & Exercise – The Neo has normal dietary needs, though they will eat plenty of food for their size. This dog breed does have high exercise needs. They can exist with a small yard, but it’s best if they get regular walks each day. You should be careful of exercising them in the heat since they are prone to heatstroke. 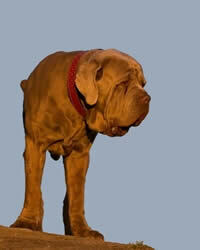 Health – The Neapolitan Mastiff can be prone to cherry eye, canine hip dysplasia, bloat, pano-ostiosis, and heatstroke. If you are interested in getting a Neo you should talk to a breeder about the health issues in the breed. Neos are very intelligent dogs and dog training is quite possible. However, since they do become very large and powerful dogs it’s necessary to start training very early, when the dog is a young puppy. These dogs do not respond well or at all to harsh training techniques. They have a very high tolerance for pain so any method which uses correction or punishment will fail. Instead, you should use positive dog training methods (praise, rewards). Neos also need a great deal of early socialization so they will accept friendly strangers and other animals.